Iran Ortiz’s eyes scan a rack of blush pink tops, her face in deep concentration under a trapper hat. 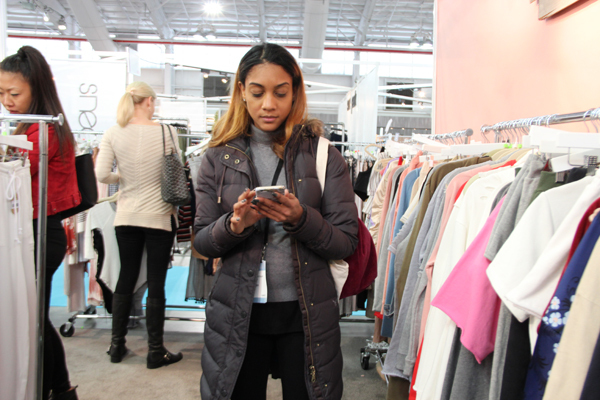 Techno music and chatter surround her on this recent January afternoon, but she never loses focus amid the chaos of the fashion trade show in Manhattan’s Javits Center. 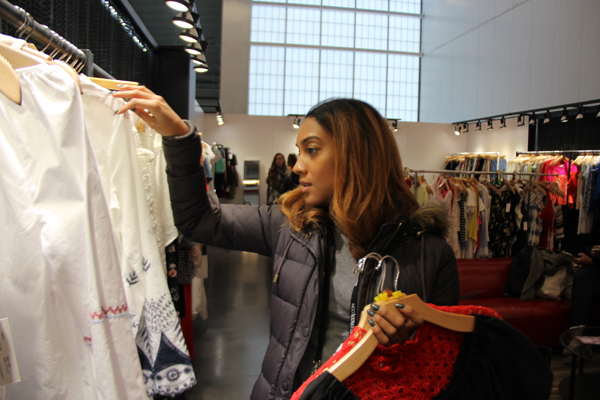 She’s in search of the latest fashion trends – gorgeous new looks for one of her businesses. Ortiz, 33, is a Latina entrepreneur fighting for success in New York City. 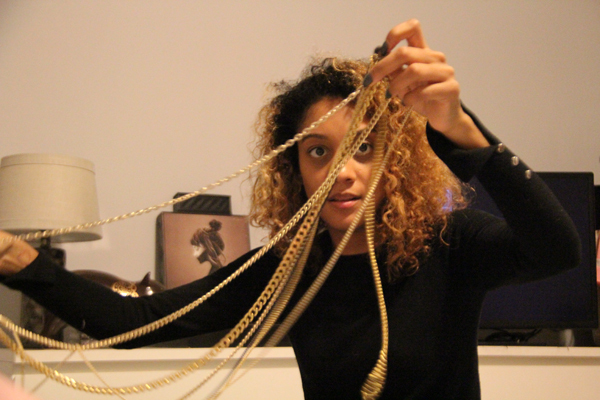 She spends her days juggling a bartender job, a podcast she co-hosts with two other women, and two businesses – her jewelry line, Endless Noise NYC and her clothing store, Le Suite Boutique, the latter of which she launched three years ago with Mareana Rosario-Torres. The daughter of a home attendant and mechanic turned government official, Ortiz didn’t grow up around many entrepreneurs. This particular Monday afternoon would be the beginning of a busy workweek for Ortiz. 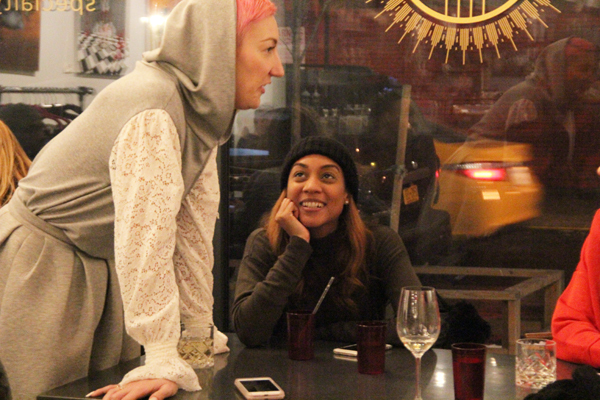 There was a new podcast episode to record, a networking event to attend in upper Manhattan with other creatives, jewelry to work on and some more shifts at Dyckman Bar. Ortiz is always working and her journey, like that of many minority women entrepreneurs in the United States, has not been without its bumps and bruises. Nevertheless, she continues to navigate her way around this complicated world of business and big decisions. There’s no hesitation when you ask Ortiz about entrepreneurship. In 2012, U.S.-based Hispanic women owned 1,469,991 businesses, according to a National Women’s Business Council analysis of the 2012 Survey of Business Owners. This figure represents nearly 35 percent of all Hispanic businesses in the country. The number of minority and women-owned businesses each rises by more than 2 million nationally, according to data from the United States Census Bureau. Between 2007 and 2012, minority-owned businesses increased by 38 percent and Hispanic-owned business by 46.3 percent. Being a multi-tasker, entrepreneurial, and resilient like Ortiz is the “Latina story,” according to Dr. Placida Gallegos, a faculty member at Fielding Graduate University and founder of Solfire Consulting. Ortiz has been working on her own time over the past several years. She was one of the founding members of Made Real Vodka, a liquor brand that ended production in the fall of 2016. 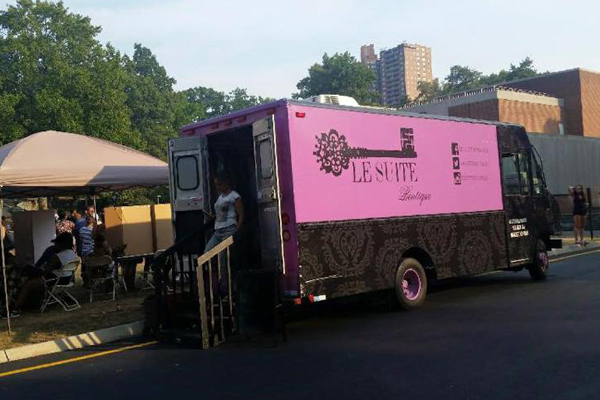 The businesswoman is now focusing her energy on rebranding Le Suite Boutique, which got a lot of buzz several years ago by local and national media for being a fashion boutique truck. Ortiz says she is working on moving the business online. Rosario-Torres, 38, says she and Ortiz have gone their own ways as far as the business is concerned. However, Rosario-Torres notes a bit defensively, she is still fully invested in it. When she and Rosario-Torres first parked their Le Suite Boutique truck on Dyckman Street, one of the busiest streets in Manhattan’s Inwood neighborhood, Ortiz’s identity as a Latina entrepreneur on the come up was tested. Whenever the two women parked the purple truck around New York City, they would announce their location through social media so their customers would know where to find them. The woman, Ortiz says, uploaded a photo of the boutique truck, calling it “not classy at all.” Ortiz’s voice takes on a defensive tone as she recalls the back and forth that ensued in the comment thread. “I consider myself to be a classy business,” she says. Ortiz says she defended herself at the time and supporters also jumped in. If she was white, Ortiz says, the woman likely would not have taken that route. 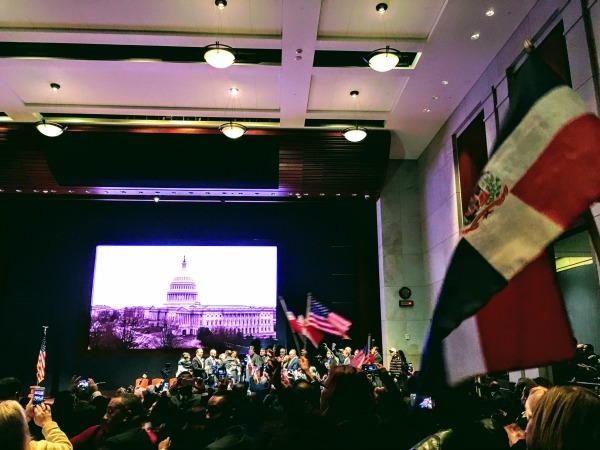 Ortiz was born in the Dominican Republic and, at three months old, her family packed up their things and moved to the United States. It was in New York City’s Bronx borough where the family carved out their lives over the next few decades. These early memories flood Ortiz’s mother, Ana Ortiz, on a recent January morning in her Bronx apartment. Before her on the dinner table lay albums filled with family photos, many of them tinted pink from old age. The 59-year-old Ortiz chuckles to herself as she studies a photo of Iran as a baby crawling. Her smile widens. Iran was a quiet, obedient child, the mother of three recalls, but she was tenacious. With sweet nostalgia, Ortiz glimpses at the early childhoods of Iran and her two other daughters, Aniusha and Sabrina. On a wall in the living room hang portraits of the three sisters in their first communion dresses. Iran says she grew up in a strict household and attended Catholic school through eighth grade before moving onto public school. She wasn’t allowed to date as a teen, nor could she spend a lot of time outside with friends after school. “I had one friend in high school and one friend in grade school that I was allowed to spend time outside of school with,” she says. Iran says she’s now thankful to her parents for raising her the way they did. 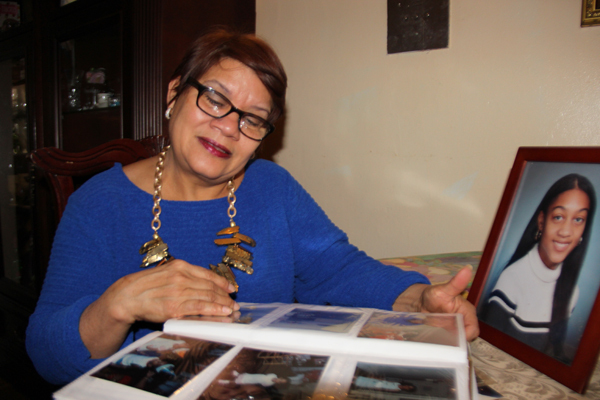 Back in Ortiz’s Bronx home, the proud mother says Iran is still as persistent as ever. Mi hija (my daughter), she says, doesn’t let herself fall behind. “If she starts something and it doesn’t go well, she has this tremendous spirit to fix it,” she says. As a young girl, Iran dreamt of owning a store someday. Building an empire, though, wasn’t part of her plan until several years ago. The businesswoman credits her father, Tomas Ortiz, for helping to instill a fierce sense of independence in her. Below, hear Ortiz speak about the influence her father has had on her. “I always think of my customers, especially the ones that buy a lot from me so I’m always thinking ‘This will look fine on Yoli or Ori,’” she says, her eyes widening with excitement. Yoli and Ori are two of Ortiz’s closest friends. “A lot of my customers are my personal friends but they’re all different and they’re what any of my customers would be,” Ortiz says. Ortiz explores the venue for a while. When she sees something she likes, the entrepreneur stops, jots down notes, places an order, and snaps photos of the clothing tags with her phone. Occasionally, she checks her emails and text messages. 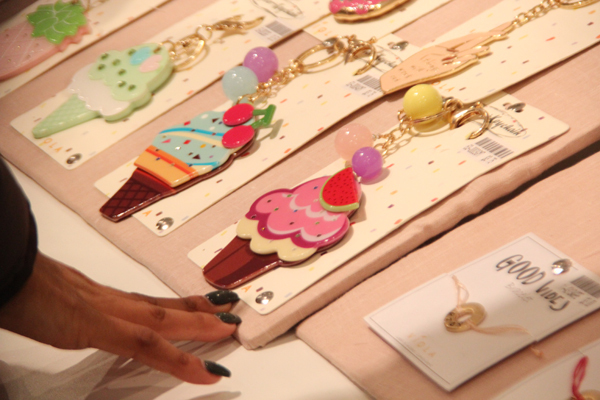 At Pixie Mood, Ortiz takes a look at purses and accessories dubbed cruelty-free and vegan-friendly. At Honey Punch, she looks at tops. Later on, she picks up and examines rings at Susan & Company and charms at another kiosk. “They could hang them on their bags,” Ortiz says after picking up a pineapple charm. Like a good millennial, Ortiz stays on top of fashion trends through the Internet and social media – especially Instagram. The following day, on Tuesday evening, music booms inside the walls of Dear Mama Coffee, a specialty coffee bar in East Harlem. Colorful works of art hang from the walls and “You are appreciated East Harlem” is painted on the floor. More than a dozen people are in attendance for “Creative Hour,” a weekly networking party hosted by Ortiz’s longtime friend, Vesna Savcic. Ortiz stops by to show support with her boyfriend, Chris Smith, 28. There have been many times, Ortiz says, when Savcic has encouraged her business endeavors. Ortiz says she receives a lot of support from the women in her life – her two sisters and friends like Savcic. Do it, they’ll say. Ortiz is always told not to be afraid. Savcic, a men wardrobe stylist and image consultant, says she and Ortiz have always been able to bounce ideas off each other. Entrepreneurship has bonded them. Ortiz sits in her cozy bedroom in her Manhattan apartment. It’s a recent Thursday evening and the bed has been transformed into a workspace. Before her is a plastic box brimming with tiny jewelry parts. Ortiz holds up a golden chain that a customer has asked her to fix and gets to work, her neatly manicured hands moving expertly. Several years ago, Ortiz found herself in a financial crisis after being laid off twice in six months. 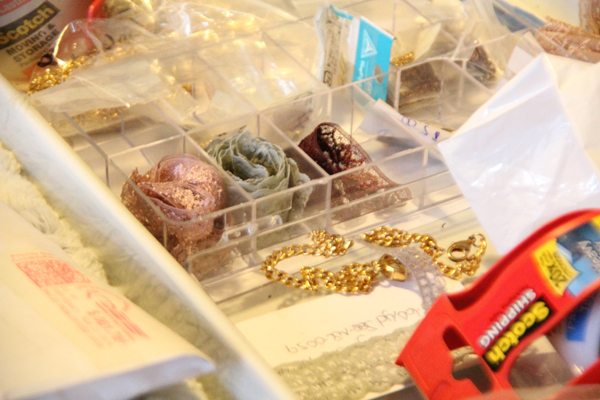 She says she began making jewelry to help pay the bills and that’s how Endless Noise NYC was born. Working as a bartender took a heavy toll on Ortiz, who says she found it hard to stay focused on her business during the day. Ortiz joins other Latina and black women who, despite being among the fastest growing entrepreneurial segments in the United States, continue to face many challenges such as lack of access to financial capital and, often times, lack of mentorship and guidance. Distrust of financial institutions is another barrier, Stengel says. Community development financial institutions, she adds, can help. There are also entrepreneurial programs that provide training, mentorship and access to capital. Stengel, herself an entrepreneur, has been tracking women’s entrepreneurship since the 90s. She is currently conducting a study on Latina entrepreneurs for the National Women’s Business Council, considered the U.S. government’s only independent voice for women entrepreneurs. NWBC executive director Esther Morales says the study, which also investigates why Hispanic women-owned businesses are growing in number yet lagging in revenue and employees, should be released sometime this year. According to Morales, an updated analysis of the 2012 survey of business owners and self-employed persons shows there are 9,878,397 women-owned businesses, employing 8.4 million employees and generating $1.4 trillion in receipts. 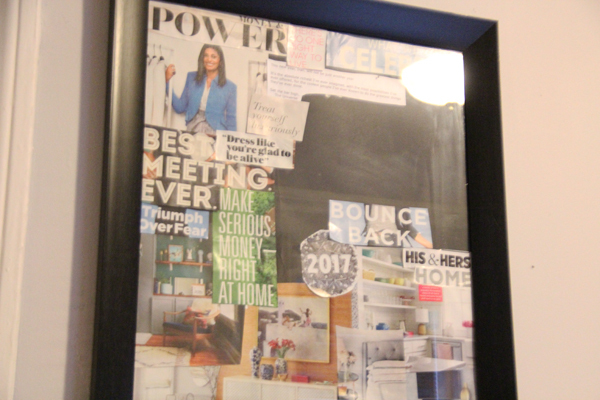 In Ortiz’s bedroom wall hang two vision boards to help her stay motivated. The one she created for 2016 is covered in magazine clippings that read “Girl Power” and “Be the Badass in Charge. Lynda Carter dressed as Wonder Woman is positioned in the lower left corner of the frame. Ortiz’s vision board for 2017 is nearly complete. Some of the clippings read “Triumph Over Fear” and “Money & Power” and there’s a photo of a smiling, professional-looking woman in a blue blazer. Reporting for this story was supported by the International Center for Journalists and S&P Global.